On 24 June 2013 the BBC website referred to “Aggressive behaviour by nesting seagulls has led to a Belfast business erecting warning notices to customers. 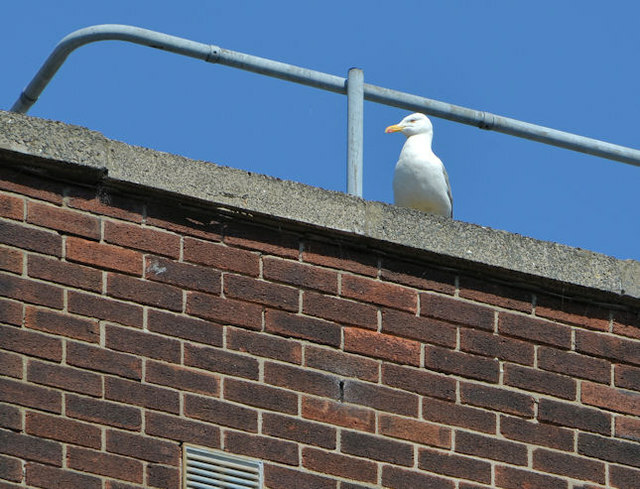 Bird experts said the high flat roofs of inner-city buildings offer the perfect site for gulls to incubate their eggs and raise their young”. This one is on the roof of 51-57 York Street – a property soon to be demolished – see J3374 : York Street demolition work, Belfast (2013-3). The behaviour of urban gulls (whose natural instinct is to protect their young) is a feature of central Belfast - see also J3474 : Gull on roof, Belfast (March 2010). Continue to J3474 : Gull and streetlight, Belfast (2013-1).